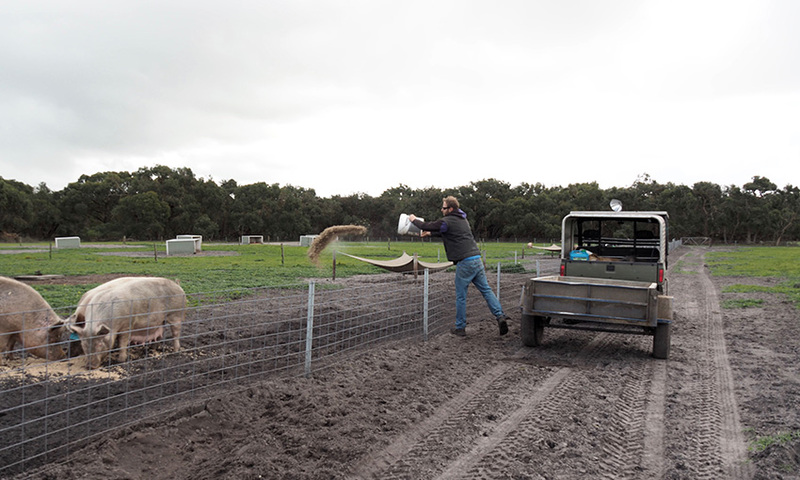 With booming interest in fine food culture resulting in a new, lucrative gourmet economy for South Australia – a South East farmer is finding profit in a more natural approach to working his livestock and land. 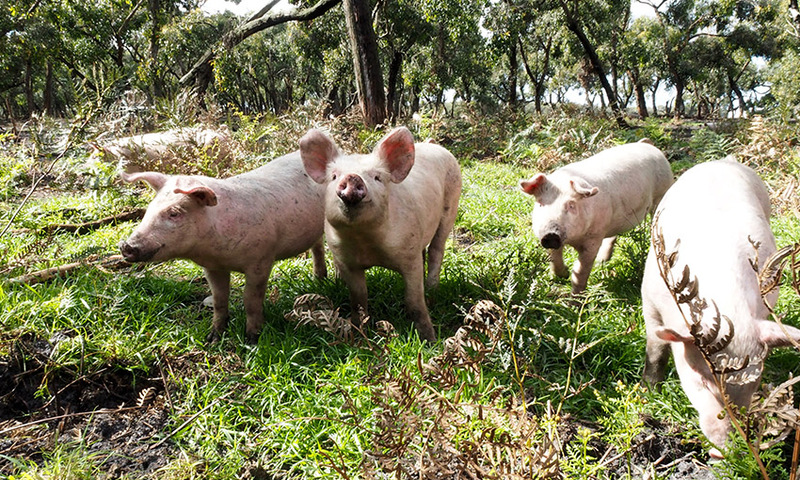 Award-winning Limestone Coast free-range pork farmer Steve Slape and Adelaide Hills charcuterie king Anthony Skara are reaping the rewards of a more humane and sustainable approach to farming and food production. Steve is a young farmer at 31. 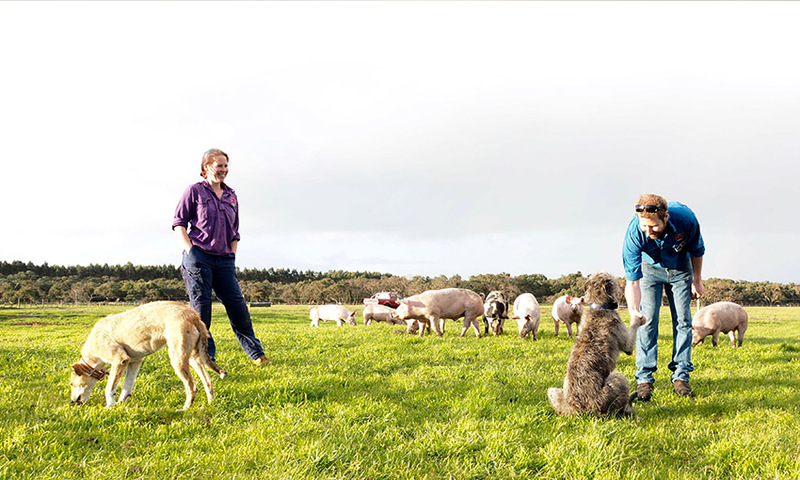 He gave up shearing three years ago to concentrate on expanding pig production to meet bursting demand from his major commercial buyer, Adelaide Hills-based Skara Smallgoods. “We met Skara by chance and now have a strong partnership,” Steve says. “Our operation grew bigger than anticipated with their encouragement and I’ve been able to return to work on the family farm, where the pigs live entirely outdoors with shelters in their paddocks and pens. Diamond Springs – the name of Steve and his family’s farm – won the Champion Pork award in the branded meat category at the Sydney Royal Fine Food Show this year. “The quality of the meat largely reflects changes to their food intake as the weather fluctuates, which lead to periods of compensatory growth resulting in fat deposits that store moisture and flavour in the meat. “We feed them grain and they also dig for bugs and shoots,” says Steve. Skara founder, Anthony Skara has seen the good, the bad and the ugly of meat growing practices during his 30 years in the industry and says high-end charcuterie requires a quality raw material. Skara Artisan Smallgoods experienced near 100% growth over the past 18 months and Anthony is dedicated to sourcing his company’s meat exclusively from South Australian producers. 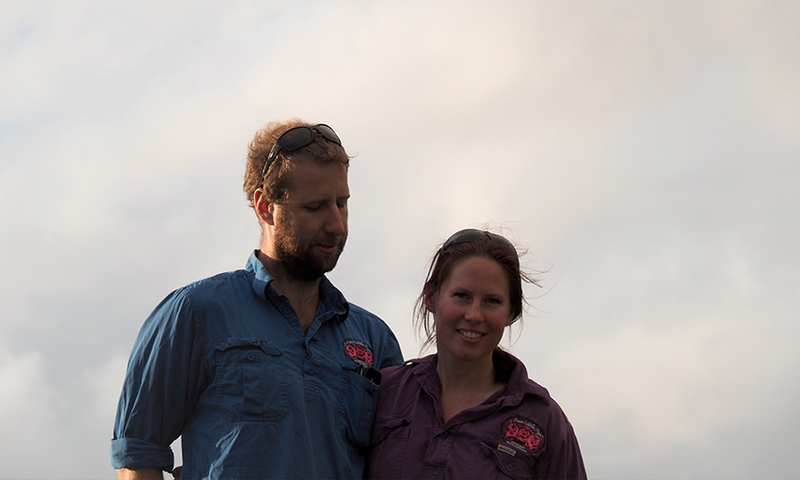 “Our farmers are part of our story,” he says, “and we’ve had a good relationship with Steve and Rose [Slape] for the past seven years. 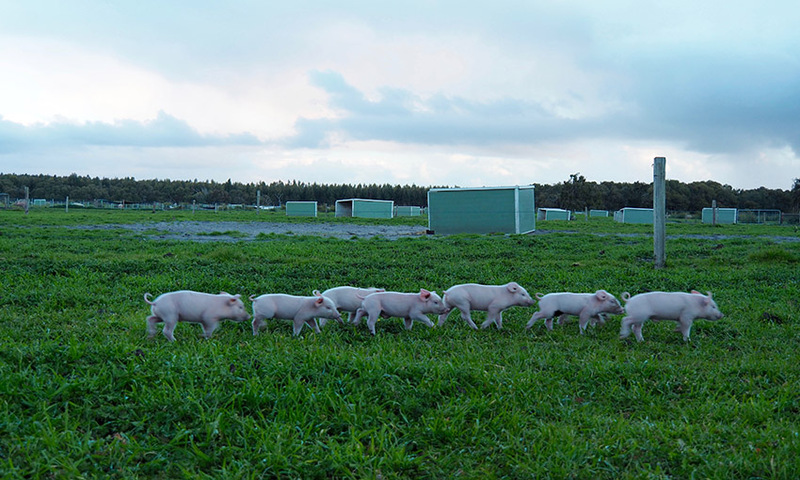 Diamond Springs is one of nine free-range pork farms in SA accredited by industry body APIQ, and submits to annual environment and animal welfare audits. Steve and his wife Rose, who actively supports the pork operation while working as an electrician, had to get EPA approval and a change of land use permit from the local council as the land – a soldier settler block the Slapes have farmed since 1938 – was previously licensed only for the commercial production of beef and lamb. The idea to move into pork took root after Steve brought in two sows to control bracken fern in 2010. “They ate the fern, which sheep and cattle won’t touch,” he says, “and had a positive impact on the soil. “This led us down a path of holistic regenerative farming practices, mimicking patterns we see in nature instead of fighting them and seeking out natural products over synthetics. 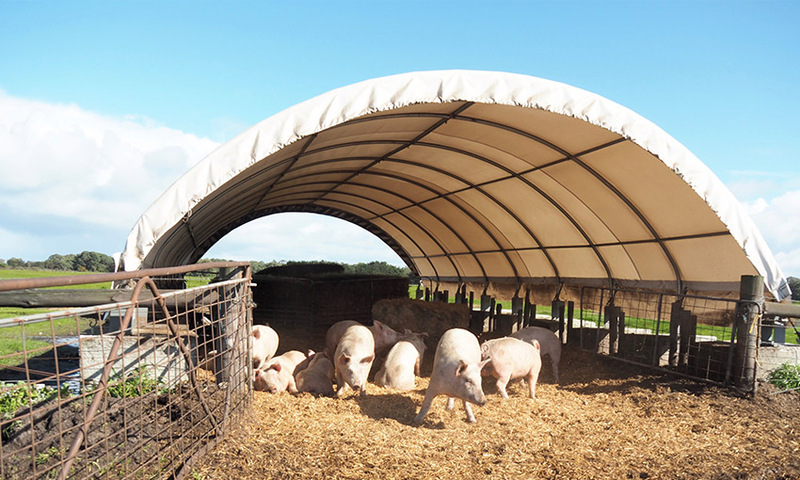 “We also encourage the pigs to follow a natural breeding cycle and the benefits are obvious when our sows have a new litter as their previous litter is going out the gate. “That said, I value the animals’ comfort more than high production targets. 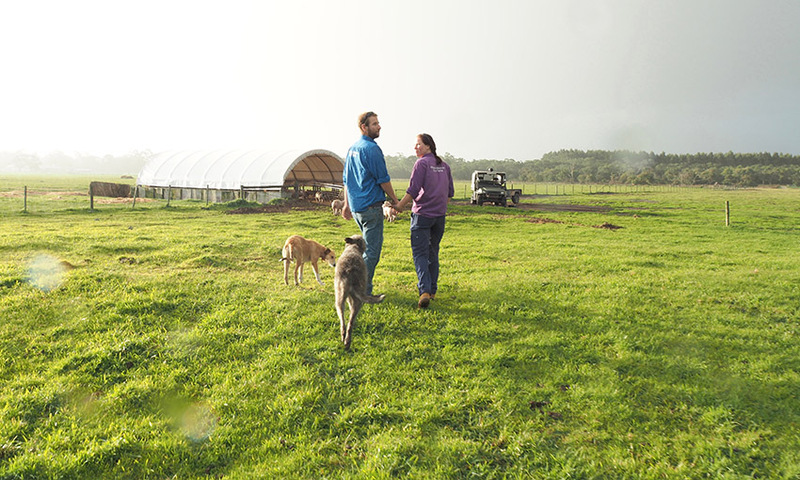 The rain is coming and CityMag is in the muck, on our stomach lining up a photo of Steve Slape and his wife Rose, successful free-range pork growers. Steve and Rose call their boisterous dogs Fi and Ava into the shot. It’s the perfect picture of the future of farming in our state.